“The Seventh Fire” Coil Bracelet. $325. SOLD. Truth lives in the illuminating fires of prophecy, and prophecy tells us that The People must live, with honor and bravery, wisdom and a good heart, through seven stages of the world. When we inhabit and transcend the Seventh Fire, we shall emerge into the Eighth, a world of whole and harmonious Indigenous sovereignty and spirit. Wings honors the prophecy and the world it promises with this last in collection and series alike, an eponymous coil of fire and light. 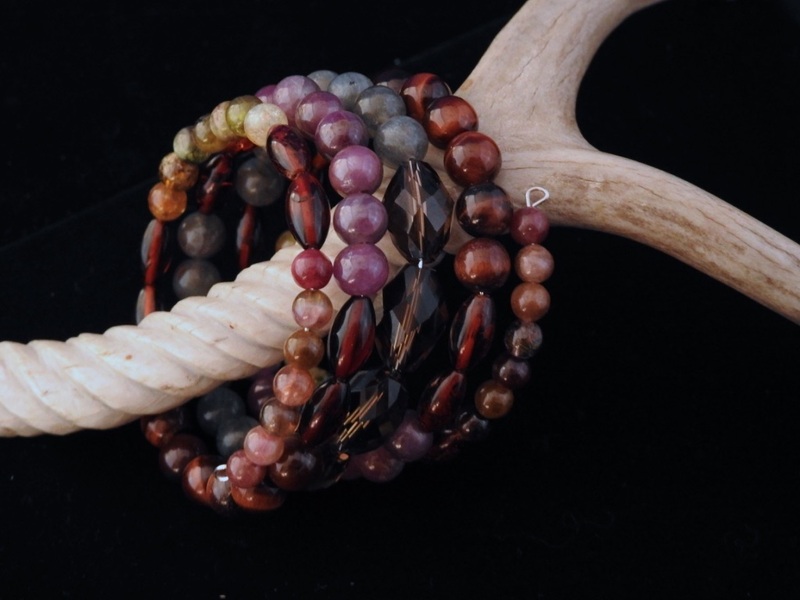 Small round orbs of tourmaline in shades of red and gold anchor either end of the spiral; matched pairs of deeply-hued amber barrel beads separate them from the next segment, a length of green garnet shot through with rusty red fire. More amber connects the garnet to the somewhat larger round beads of red tiger’s eye, the color of wine and impossibly chatoyant. Another amber pair leads to the dusky atmospheric beauty of ruby, large round orbs of mysterious mulberry-red smoke, followed by more amber and lengths of large Labradorite spheres, the gray of the heavens refracting the purer blue light of the place where the spirits dwell. At the center, representing the world of the Eighth Fire, sit four large faceted barrel beads, Eyes of Spirit rendered in smoky quartz, manifestations of not only the fires of prophecy but those of wisdom, guidance, and pure illumination. Memory wire expands and contracts to fit nearly any wrist. Designed jointly by Wings and Aji. Seventh in The Truth Collection, the final entry in The Seventh Fire Series. Posted on Saturday, December 22nd, 2018 at 12:27 pm. Filed under: The Coiled Power Collections, The Seventh Fire Series, The Truth Collection	RSS 2.0 feed.